Hello everyone! Hope you all are doing good😃. Today I will discuss bedmaking. Yes, bedmaking. A lot of us lack knowledge of how a well made bed should look like. Growing up, my mother would say to me, “ Make the bed when you get up”. We were just two girls at the time and we slept in the same bed. I always made the bed. When we had another sister, it remained the same until we had another sister. At this point, we had two separate beds. Okay, let me not bore you with my childhood lifestyle. The thing is, all I did when we get up every morning is to fold in the loose bedsheet- and that’s it! Or so I thought. This changed when I became an interior decorator and realised that there are other things that come with making a bed. 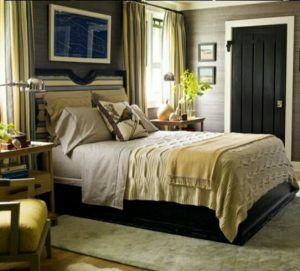 There are different ways to make a bed look attractive and beautiful. Most people don’t know this but asides the beautiful patterned bedsheet you spread on the bed, there is another sheet, a plain colour sheet which you spread underneath. If you are the type who sleeps with your air-condition on, a duvet or thick blanket is a must! 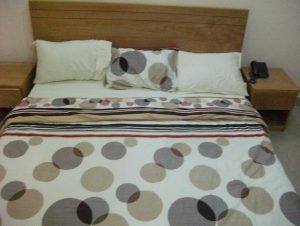 When you buy a duvet set, it either comes with a plain sheet that matches the colour of the duvet, four pillowcases of two plain and two pattern design and another sheet of the same design as the duvet, or just two pillowcases of the same design as the duvet. The last sheet is usually optional. This is because of either cost or its just an overkill – for some clients. There are some people who place the plain sheet on top of the pattern sheet rather than spread it underneath. That is, after you’ve spread the patterned sheet, you spread the plain sheet on it and fold it a few inches or a foot away from the pattern sheet and tuck it in. Then you spread your duvet and tuck it in too or just let it hang on the bed. There are people who use two pillows on their bed, some four, others more. This all depends on choice and it’s not compulsory. It just means that some people are more adventurous than others. Nothing wrong with that. The most crucial thing about bedmaking is cleanliness☺! No matter how beautifully made that bed is, if it oozes of bad odour, or looks dirty at first glance then that’s just bad. Bedsheets should be changed every week, even if you don’t sleep in the bed. It would surprise you to know that dust actually gathers on the sheets in your absence. Often times we sweat, our hair cream give our pillowcases another design or we stain the sheet with food particules such as: soups, cakes, biscuits, etc, etc. For this reason sheets MUST be changed on a weekly basis. So go make that lovely bed you dream of and I’ll catch up with you soon 😉.